Werner's Cairns blog: Attention Greens, here are some carbon facts. Climate Change Fraud! To read more click here. Professor Ian Plimer could not have said it better! If you've read his book you will agree, this is a good summary. Australians showed sense in resisting the govt pressure to agree to a carbon tax before the Copenhagen Conference - which seems years ago now. Okay, here's the bombshell. The current volcan ic eruption going on in Iceland, since its first spewing of volcanic ash has, in just FOUR DAYS, NEGATED EVERY SINGLE EFFORT you have made in the past five years to control CO2 emissions on our planet - all of you. Click on picture to enlarge! Of course you know about this evil carbon dioxide that we are trying to suppress - it’s that vital chemical compound that every plant requires to live and grow and to synthesize into oxygen for us humans and all animal life. I know, I know.... (group hug)...it's very disheartening to realize that all of the carbon emission savings you have accomplished while suffering the inconvenience and expense of: driving Prius hybrids, buying fabric grocery bags, sitting up till midnight to finish your kid's "The Green Revolution" science project, throwing out all of your non-green cleaning supplies, using only two squares of toilet paper, putting a brick in your toilet tank reservoir, selling your SUV and speedboat, vacationing at home instead of Bali, nearly getting hit every day on your bicycle, replacing all of your $1 light bulbs with $10 light bulbs ...well, all of those things you have done have all gone down the tubes in just four days. Oh, I don't really want to rain on your parade too much, but I should mention that when the volcano Mt Pinatubo erupted in the Philippines in 1991, it spewed out more greenhouse gases into the atmosphere than the entire human race had emitted in its entire YEARS on earth. Yes folks, Mt Pinatubo was active for over one year - think about it. I'm so sorry. And I do wish I had a silver lining to this volcanic ash cloud, but the fact of the matter is that the bush fire season across the western USA and Australia this year alone will negate your efforts to reduce carbon in our world for the next two to three years. And it happens every year. Hey, isn’t it interesting how they don’t mention “Global Warming” any more, but just “Climate Change” - you know why? It’s because the planet has COOLED by 0.7 degrees in the past century and these global warming bull artists got caught with their pants down. And just keep in mind that if that same government is re-elected, you will have an Emissions Trading Scheme - that whopping new tax - imposed on you, that will achieve absolutely nothing except make you poorer. It won’t stop any volcanoes from erupting, that’s for sure. But hey, grab a beer, give the world a hug and have a nice day! 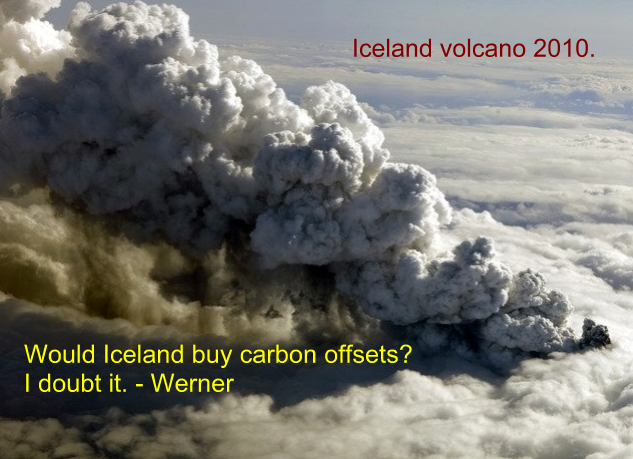 PS: One has to wonder if Iceland is buying carbon offsets. Thanks for this post ,Werner! If this carbon tax comes in because the masses still don't get it , our best hope for a reality check may be that few people will be able to watch TV and have time to think for themselves instead of filling their heads with lies. Once they find the truth and live accordingly , we can have a global hug in celebration of surviving globalization ! In hope for a future for life. In my 15 years in Parliament I recall seeing thousands of jobs lost due to the rotten green movement who through weak Councils and Governments forced closures of Companies and stopped new Companies from starting. At 76 years of age I am concerned for my children, grandchildren and great grandchildren if Labor, with the Green's preferences, is successful on Saturday August 21st. Our debt will increase as all Labor Governments and Councils believe that money grows on trees (they always do).